Here at Truly Deeply we love a good flash mob, especially if there’s a way that brands can create the magic without souring it with commercial intent. 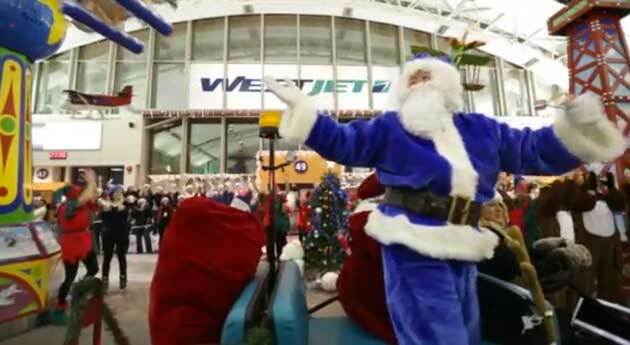 Last week Canada’s West Jet airlines surprised passengers waiting for their red-eye flight from Calgary to Toronto with a first class, impromptu festive brand experience. On December 4, we decided to surprise 166 guests waiting to board a Calgary-Toronto red-eye flight with a little Christmas cheer. We invited elves, snowmen, carolers, sugar plum fairies, reindeer and Santa Claus, himself, to help us make this a memorable evening. Thanks to all our guests for joining in on the fun! Guests were not only treated to this memorable performance, but staff handed out treats and hot chocolate, hugs for everyone from Santa and a Christmas stocking with a card and an iPod shuffle – way to make an impression. During an economic climate that finds most airlines around the world struggling, West Jet has grown to a powerhouse niche brand who knows who they are and what their value proposition is. And as a brand they’re not afraid to go way out there to make sure everyone knows exactly what they’re about. We hope you all have a wonderful festive season and look forward to sharing a Truly Deeply 2013 with you. Buckets of Christmas Cheers from the Truly Deeply crew. The 8 ways online has changed the way we shop and what traditional retails should do about it. Owning a mark – When a bracket is worth fighting for?